United Edge Real Estate and Auction Co.
Payment Instructions: Participation Requirements: Valid Credit Card required for bidding approval Payment Options: Visa, MasterCard, Discover, American Express. Cash or Verified Check. Payment Instructions: Winning bidder will be contacted upon completion of the auction to confirm payment type. Payment must be received within 24 hours. No items will be removed until payment has cleared. Shipping Instructions: All shipping logistics and costs are the responsibility of the buyer. Preview Date & Times: Items can be inspected during regular daily business hours. Contact Kip Pahl at 419-212-2755, or Darren Bok @ 419-769-2399. Checkout Date & Times: Item will not be released until payment has cleared. Pick-up M-F during normal business hours. Driving Directions: Online only auction. Edgerton, OH is located at the intersection of US Hwy 6 and St. Rt. 49.
Credit card required to register for auction. Payment due within 24 hours. Item will not be released until payment has cleared. 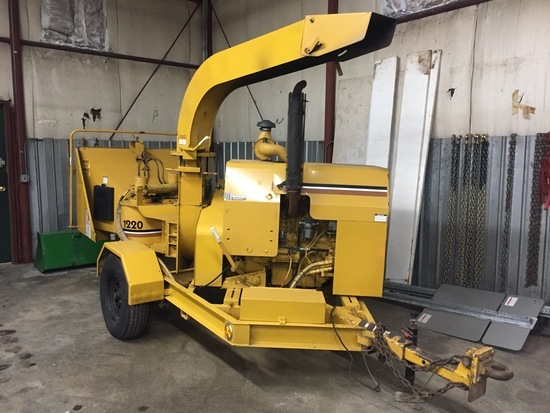 1992 Vermeer 1220 Chipper with feeder Model 1220BC, 5,346 Hours, Perkins diesel motor, includes 2 extra sets of blades (plus the set currently on the machine). S/N:1VPD...more15117N1000291 This unit has been well maintained and is in great working condition. The village has decided to upgrade to a newer model, or they would still be using this machine. Items can be inspected during regular daily business hours. Contact Kip Pahl at 419-212-2755, or Darren Bok @ 419-769-2399.